This remarkably detailed large format map of India and parts of bordering countries highlights the means of transportation in mid-19th century India of both people and goods in the vast region depicted. The map shows political divisions of that time including British Possessions, Subsidiary States, and Protected and Independent Regions. It also notes Civil Divisions including the Lower Provinces of Bengal, North West Provinces & Oude, the frontiers of Punjab and Assam, Mysore and the Native States, to name a few. Ceylon (now Sri Lanka) is highly detailed as well. Post roads and routes are depicted and labeled, as are completed railways and those only sanctioned at the time. 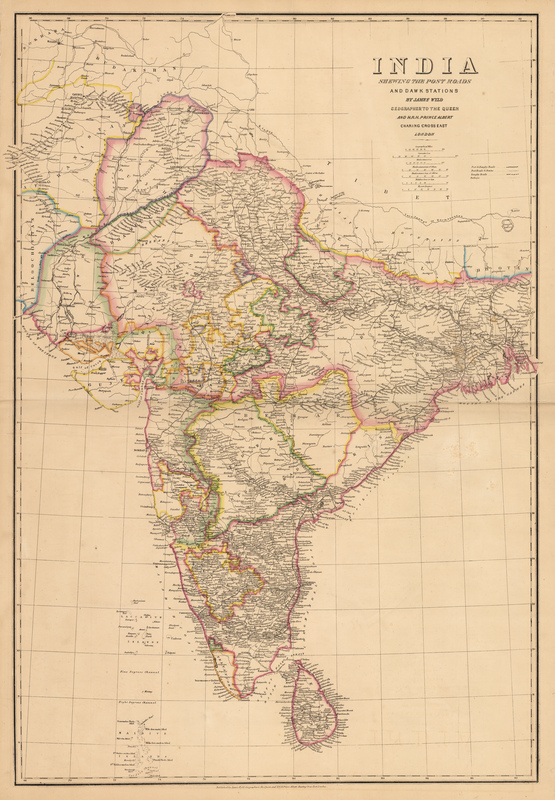 The amount of detail in the map conveys the extent to which the Indian subcontinent was known and charted by the British. Geographical features include mountain ranges and river systems. The Himalayans are named and Everest is duly noted, as are famed mountain passes, and towns and cities whose names are well-known today. James Wyld II was Royal Geographer to Queen Victoria and Prince Albert, an honor which he shared with his late father, and was active throughout much of the nineteenth century. Condition: This linen backed map is in A condition.